Clary Fray just wishes that her life would go back to normal. But what's normal when you're a demon-slaying Shadowhunter, your mother is in a magically induced coma, and you can suddenly see Downworlders like werewolves, vampires, and faeries? If Clary left the world of the Shadowhunters behind, it would mean more time with her best friend, Simon, who's becoming more than a friend. But the Shadowhunting world isn't ready to let her go -- especially her handsome, infuriating, newfound brother, Jace. And Clary's only chance to help her mother is to track down rogue Shadowhunter Valentine, who is probably insane, certainly evil -- and also her father. To complicate matters, someone in New York City is murdering Downworlder children. Is Valentine behind the killings -- and if he is, what is he trying to do? When the second of the Mortal Instruments, the Soul-Sword, is stolen, the terrifying Inquisitor arrives to investigate and zooms right in on Jace. How can Clary stop Valentine if Jace is willing to betray everything he believes in to help their father? Review: I'm going to keep this review short, because I have a lot to say about this series but I'm going to save it for my review of the third book, which I'll post early next week. This book was very much a bridge book, as 2nd books always are. I enjoyed watching the relationships develop (and crumble), and I liked learning new things about the characters. However, I felt the plot just wasn't as exciting as it was for the first one. Everything was much more relationship driven (which is not surprising). And although the "plot" (meaning the action-oriented plot) was interesting, it took a backseat. However, I gave this book a higher rating than the first because it was definitely more original and interesting. I can totally see what makes this series so popular. Look for my review of City of Glass next week, where I'll reveal my overall feelings for this series. 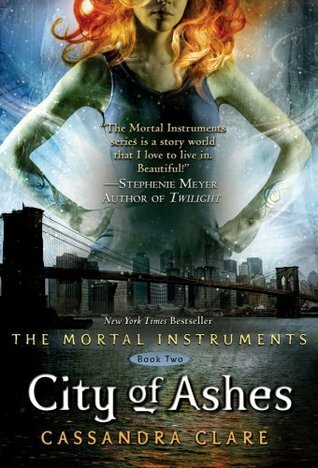 0 Response to "City of Ashes-- Cassandra Clare"